Chifon thinks back to Sanji making the cake, and he has this big grin on his face. She reminds him how important this is --that he holds the fate of the kingdom and his own life in his hands --so how can he smile? 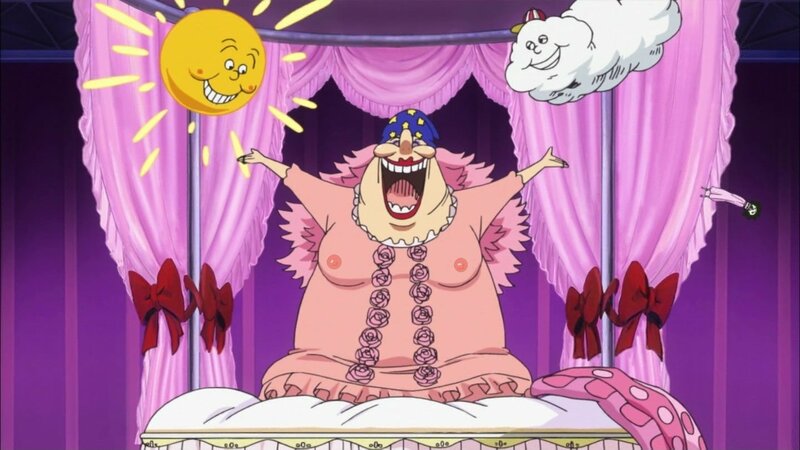 He's like "I just thought about BIg Mom's expression of happiness when she eats this"
Big Mom loves the cake. "It's so delicious, I could die!!" Peros and the others are convinced there's no poison --or if there is it didn't work. 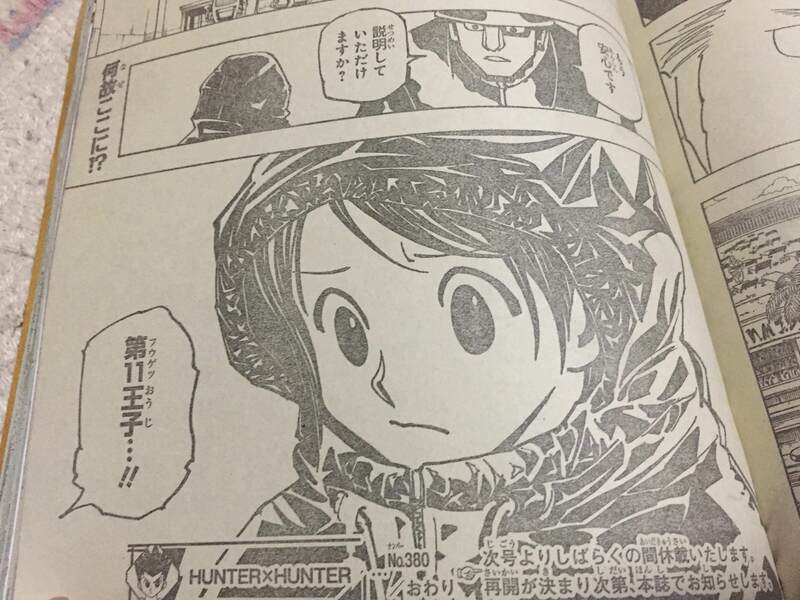 He has them report to everyone on the island that it was Pudding who saved them from Big Mom's craving. 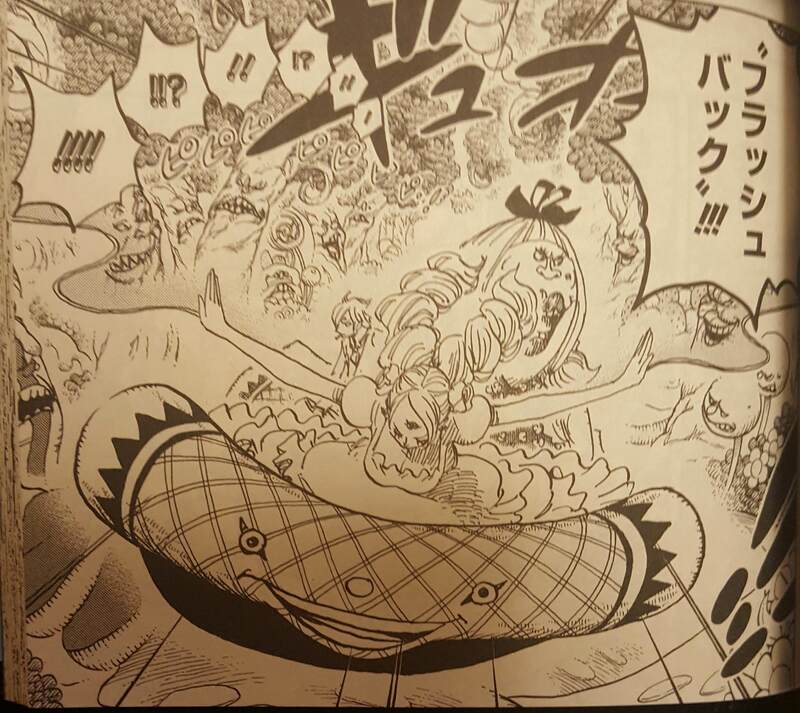 Pudding sits alone as everyone celebrates her great work, "No...it wasn't me..."
Meanwhile Jinbe's crew opens a path for the Strawhats to escape through. 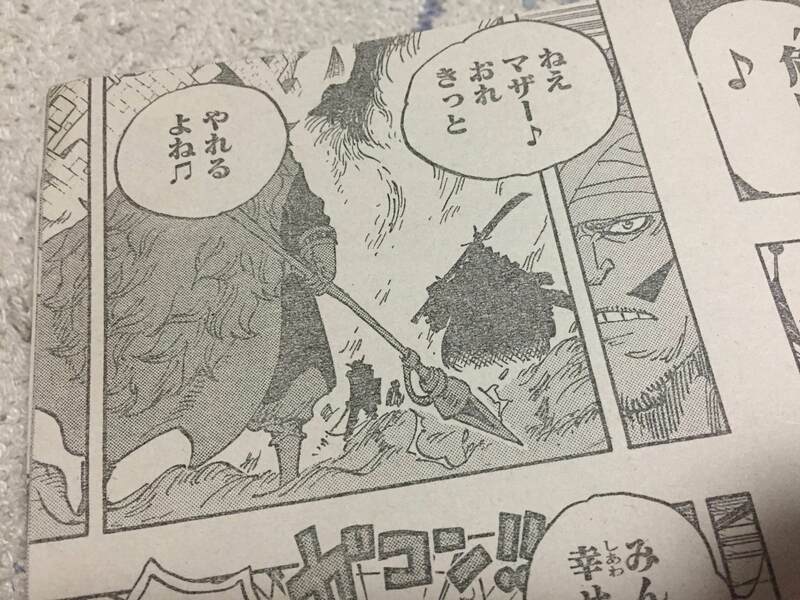 Oven gets back and he's pissed at Luffy for defeating Katakuri. 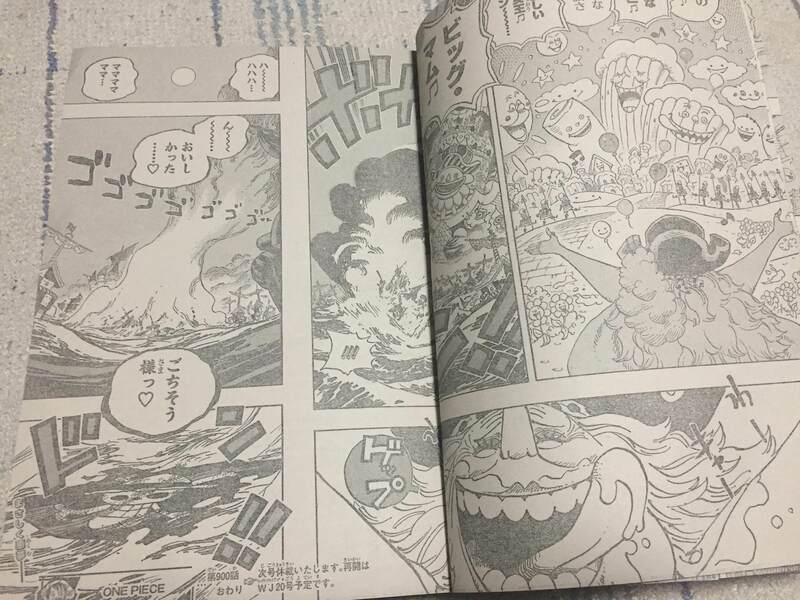 The Strawhats are already sailing off, and Aladdin tells Luffy to take care of Jinbe. This takes out the entire Sun Pirate crew. Anyway, the "Queen Mama shante" is soon to arrive and Mondor is happy it made it in time. Mama starts to sing about the flavor of the cake as her ship closes in and starts wrecking everything. She's reminded of her birthday party way back when --the last time she saw Caramel. The Germa are also all wiped out or bleeding. Judge is apparently surrounded by two new characters --one is a large dude with a spear and another is a smaller dude --they're in shadows though. "Everyone is happy" Mom sings "It's a peaceful world!" 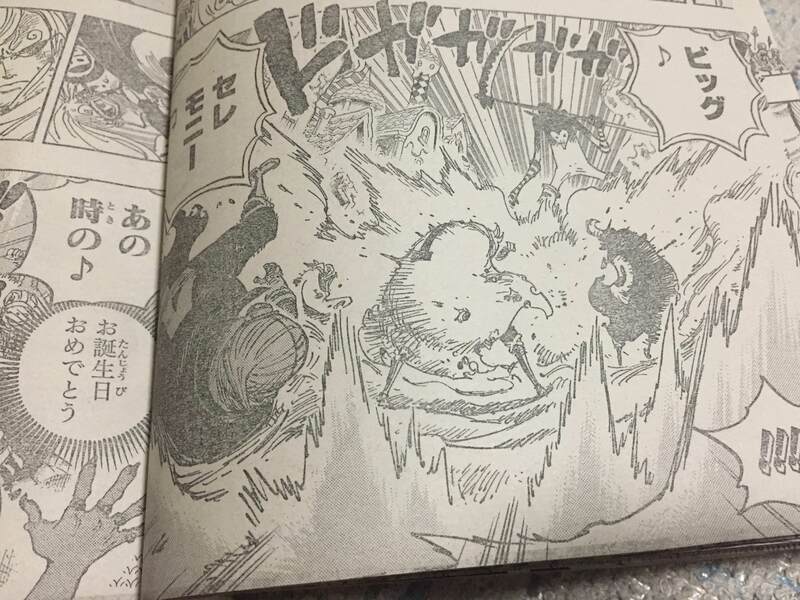 "Species doesn't matter~" "But if anyone tries to leave, I'll kill them~"
"A contract with the devil"
A canon opens fire on the sunny seemingly obliterating it --the only thing left is the Straw hat flag floating on the sea. Mama says "Delicious" as the fire engulfs the ship.